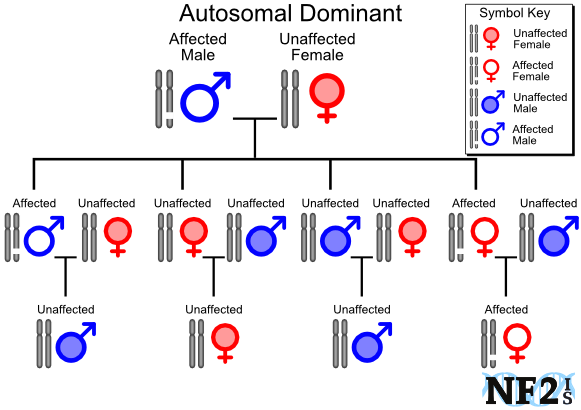 Neurofibromatosis (NF): NF1, NF2 and Schwannomatosis, are a genetic Autosomal Dominant conditions, which means each child a parent with NF1, NF2 or Schwannomatosis male or female has a 50% chance to born with the form of NF their parent has. A Sporadic Mutation, which is the development of a condition neither parent had, is common development of NF. First generation NF can be a mild mutation in comparison to future generations, depending when in prenatal development that damaged cells from NF started to develop in the cells of a unborn child. 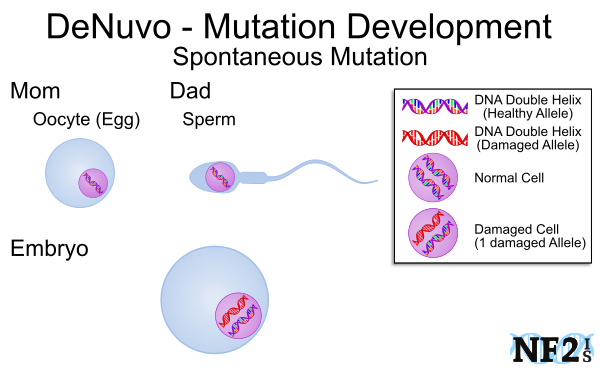 NF can occur when sperm meets egg even if neither parent had NF, but if the genetic damage occurs after that, it would be a segmented mutation, also known as Mosaic or DeNuvo mutation. Mosaic NF can be less harmful to a person than someone who is born with damaged cells in their whole body, as their children who would be at risk would have. A child born of an individual with NF1 or NF2 is at a risk of a more harmful case of NF than their parent. This is different for a yet to be determined reason, for people with Schwannomatosis, where they can be born with Schwannomatosis and not show any symptoms. The NF1 gene, improper function of the Ras Pathway, is on Chromosome 17.q11.2. The NF2 gene, the NF2 protein, also called MERLIN, is found on Chromosome 22q12.2. The Schwannomatosis gene, which develops from damage to either the INI1 protein (also called SMARCB1) or the LZTR1 protein, is found on Chromosome 22q12.21.